More than 500 people are roleplaying in the expanded universe of The Office by writing in-character reviews at the travel site TripAdvisor.com. Only they probably don't know they're roleplaying. Does that matter? My background is in tabletop RPGs, and when all you have is a hammer, everything looks like a nail. When it comes to finding a definition for virtual worlds and the things we do in them, I have more questions than answers, but that's the way it's supposed to be. Virtual worlds should be provocative, not conclusive. A good virtual world should prompt participants to expand the universe in which that virtual world turns. Virtual worlds include those areas where people's shared awareness overlaps. The more people that can agree on the details of their shared, imaginary universe - its unofficial subcultural canon, if you will - the bigger that universe gets along one axis. The more works that are absorbed into the subculture's canon, the bigger that universe gets along another axis. Not every overlap is perfect; not every intersection of ideas is as mathematically tight as the vesica piscis. Even fewer are so simple. Popular consensus isn't that popular - the multitude of overlapping areas result in dozens of tiny virtual worlds. 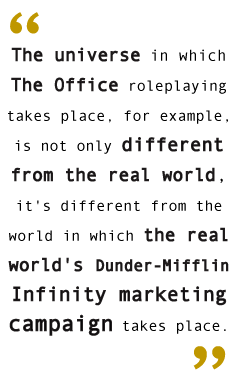 The universe in which The Office roleplaying takes place, for example, is not only different from the real world, it's different from the world in which the real world's Dunder-Mifflin Infinity marketing campaign takes place. You can tell them all apart by the number of Dunder-Mifflin paper-company offices set up across the country. In the universe of the television show, the company has just eight branch offices. In the universe of the Dunder-Mifflin Infinity game, the company has handfuls of offices in a single state. (In the real world, of course, Dunder-Mifflin does not exist.) Another major difference between the worlds is in the success of oddball employee Dwight Schrute's beet-farm B&B: On the television show, the operation is not popular, but in the virtual world of the marketing game hundreds of happy customers are raving about the B&B online. The "real" marketing campaign with the same name that exists within the fictional world of the show (in which the campaign involves eight offices). The fictional campaign that takes place within the virtual world of the Dunder-Mifflin Infinity "game" universe, wherein there are dozens of offices and its employees are tasked with writing reviews of Schrute's B&B. The marketing campaign that takes place in the real world, wherein real human beings log into the real Trip Advisor site and leave real fiction (not fictional) reviews of a fictional bed-and-breakfast in a real Pennsylvania town. This is the show's expanded universe, a pool of data you may choose to accept or reject in your view of the television series' virtual world. Different virtual worlds accept different facts from the pool - in an Office universe you and your friends choose to inhabit, you might choose to import the Trip Advisor reviews as genuine but discard the larger number of Dunder-Mifflin branches supposed by the Infinity game. You contribute to that virtual world by, for example, writing a review of Schrute's fictional B&B in which you abide by the facts of your virtual world. Confused? Good. You should be.